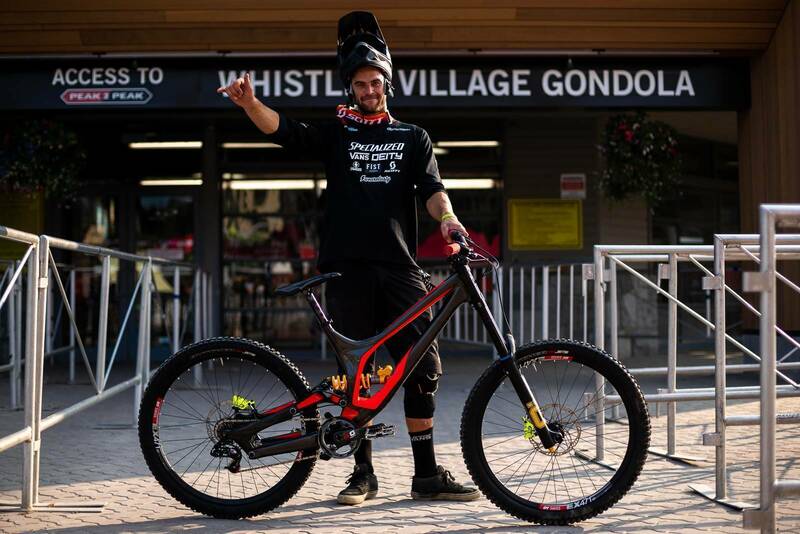 Whistler Crankworx certainly has no shortage of awesome, shred-ready mountain bikes descending the hills and making podiums on a daily basis. We here at ambmag chased down a bunch of Aussie's to talk shop about the bikes they have the most fun with. Photos and Words by Nick Waygood. A legend of the BMX racing scene and with winning speeds around a pumptrack, Caroline Buchanan out of Canberra has been climbing her way into the MTB scene for a few years now. With a rough start to the year dealing with injury, it was this same bike that took her to the win during the Rockshox Pumptrack challenge this week. We caught up with her during a practice session to talk shop about her black-on-black-on-black jump bike. It’s a frame that’s based off an older Aluminium Airbourne prototype, with a custom @cbuchanan68 sticker along the top tube. 26” Maxxis semi-slick tyres keep her rolling fast. A SRAM 7-speed drivetrain keeps her pedalling easily (when Buchanan isn’t racing pumptrack), with SRAM brakes helping control her speed. An ODI cockpit paired with a Rockshox Pike DJ keeps her rolling without issue. A man who needs no introduction to a national (or international) scene is James Hall out of Sydney. James came from a rich history of downhill racing and chasing summers, now chasing the Enduro World Series for two years going, working his way through the ranks to become the serious shredding machine he now is. We took a close look at his Enduro machine – a wagon-wheeled Pivot Firebird. It’s carbon composited with 160mm of plush Fox Suspension rear travel, and a 170mm fork in the form of a Fox Factory 36 with Grip2. Component wise, he’s decked out with Shimano XTR drivetrain and XT brakes/shifters, which are paired with ice-tech Shimano rotors. You may notice all of the ‘64’ stickers over his bike? These are places on the front and rear triangles, wheels, and forks by EWS race officials. Should James have to replace any of these parts during the race, a 5-minute penalty is handed out. To top it all off, James (along with most enduro racers) runs a cushcore in the rear to help eliminate flats on their long days. With a history of downhill racing throwing huge whips, followed by years of being a ‘free-racer’ doing the same, McMillan is widely known in the Australian DH scene. We caught up with him and his freshly built Specialized Demo 8 27.5 Alloy to check it out before he demolishes laps of Dirt Merchant to A-Line. We’ve probably all seen the videos of David destroying a corner and ripping lengthy skids, which is made possible by Magura MT7 Raceline brakes, which are some of the most powerful on the market. Deity Components keep the colours matching with Blacklabel bars, a direct-mount stem, grips, saddle, and of course flat pedals. Suspension-wise, he runs a coil rear and air fork made by Ohlins, a legendary motorbike suspension company. Rolling on DT Swiss rims paired with Specialized Butchers, Dave cranks into huge gaps with a SRAM 7-speed DH drivetrain. Straight out of (R)Adelaide, Troy Brosnan’s in Whistler, Canada to defend his Canadian Open DH wins from the previous 3 years. 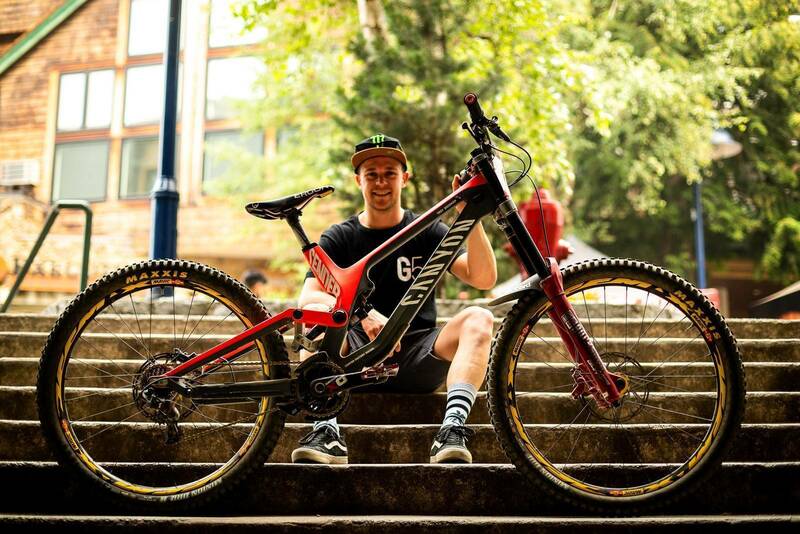 Climbing through the Downhill ranks in the world cup sceneover the past decade, Troy’s also been racing and making podiums at Crankworx for just as long, making him well-and-truly a household name. 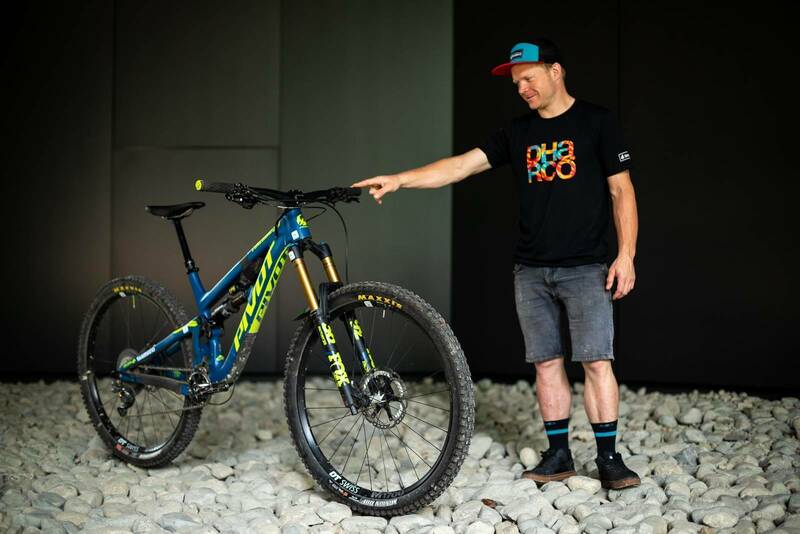 With the Canyon Factory Racing team running SRAM/Rockshox, his 27.5 carbon-composited frame is pieced together with SRAM XO/XO1 7-speed DH drivetrain, and Rockshox air shock and fork. Mavic wheels paired with Maxxis DH/F 2.5” on the front, and a Maxxis DH/RII 2.4” on the rear keep him at winning speeds and in a straight line. Troy runs titanium bolts in his stem for ultimate strength, giving the cockpit a custom look. Lastly, a custom rear-linkage has been designed as a one-off for the Canyon Factory DH team, which allows for extra performance and fits the Rockshox air shock.